Rising like a beacon from the pleasant vale of Woodend, Melbourne and central Victorian climbers alike, flock to Mt Macedon's Camel's Hump. (See: approach map). It's steep and solid rock, with a variety of short, pumpy sport routes, and taller trad lines calls to the soul of climbers not wanting to make the long drive to Araps for their fix. You'll need a trad rack to tick some of the best lines, such as the all time classic "Witch", grade 17. Not as rough as granite, not as slippery as polished sandstone, the cold blueish rock offers a texture that is enjoyable to crank. And crank you will, with some of the most fun lines, such as "Bogie Till You Puke" grade 21, being steep and muscular ascents. There isn't any starred easy routes, so if you are looking for a place to take beginner's this may not be it. (Perhaps take them to Werribee Gorge instead). However if you're leading, say, grades 16 to 20 there's plenty of quality here worth ticking, and if you're up for the more changeling grade of 25 or so you'll not be disappointed. Right: The Omega block in typical Mt Macedon weather. It can be clear skies and sunny 1km down the mountain, but Camel's Hump is often shrouded in cloud, making the rock wet to touch. This is not a four season crag. Winter is pretty much out of the question. If you're looking for sustenance, there's a reasonable bakery in Woodend, as well as several trendy cafes. There's an up market pizza restaurant that'll do you a gourmet pizza worth tracking down. If you're coming up from Melbourne the new freeway should get you there lickety split. The Camel's Hump area is nestled in a beautiful rain forest, which is both scenic and damp, so pick a day that offers sunshine. The rock can be a bit licheny on the less frequented routes, and the deeper cracks retain moisture well. It can also get quite cold standing around, or belaying from above, especially if the wind is up, so bring a jacket, even if it looks like a baking hot day elsewhere. Far Left: Steve leading Bloodline, Grade 22. (Photo: Phil Neville). Bloodline follows the obvious water streak past a few bolts. Left: Owen leading the grade 22 sport climb "Bloodline". Check the video clip Bloodline (3 Meg, 49 seconds) of Owen's lead. Hard for the grade, the crux is low on the route. The area contains two main places to climb. The first and most popular is the "Omega Block" situated just below and somewhat left of the Camels Hump lookout, as you scan the view back towards Woodend. On a sunny weekend expect to be sharing the Omega Block with a handful of other climbers. One method of getting there is to plunge into the bush at a small, unmarked trail that leaves the main tourist track up to the Camel's Hump lookout on it's left (as you head up), just as the tourist track stops ascending and flattens out a tad. This approach requires some dubious down-climbing to gain the Omega Block area below; something that can be difficult with a heavy pack. Instead, by far the easiest approach is to simply walk along the pleasant trail marked "Emergency Use Only", that leaves from the Camel's Hump car park, and weaves around to the base of the Omega Block area. If you get sick of climbing (Ha! As if! ), the continuation of this track, in the opposite direction, will take you up to the summit of Mt Macedon (parallelling the road), and is an enjoyable little forest hike with a rewarding view from the top. Let's assume you took the easy approach. When you get to the fork, head up and right for the Omega Block classics such as Witch, Bloodline, Bogie Till You Puke, etc. And head straight left along the base for Poxbow, Grey Arête, etc. For a good warm up, or a route to take a beginner on, look no further than "Grey Arete" the 25m, grade 10. It eats nuts like there's no tomorrow, offering bomber placements every few feet. The crux is navigating a tiny overhang about half way up (pictured right). At the end of the first pitch there's a spacious ledge where rap chains allow for an easy 25m abseil back down. For beginners, the Omega Block hasn't much else to offer. If you're still scratching for a sub 15 grade climb, there's a couple of short ones around the other side, just right of "Witch". Right: Michael leading Grey Arête, the 25m grade 10 that is a great climb to intro beginners to the area. Far Right: Michael leading Poxbow, the 25m grade 17. Reversing back up the trail from Grey Arête, you'll come across Poxbow, the 25m grade 17. This is a gem of a climb definitely worth trying for an onsight lead. The protection is good, even on the crux overhang finish. There's a thinky section about half way up as you go over a smooth bludge, where is pro is perhaps at it's sparsest, though don't let this put you off a stellar line. At 25m you top out onto a spacious ledge with handy rap chains and belay bolts. The line you abseil down off the chains is also worth a look (grade 18 I think), though a bit of a one move wonder. Just right of Poxbox there's a bolted route that takes a bold line up the face to top out at the same point. You can make this otherwise hard lead into an easier trad one by traversing right, under the crux and around the corner onto the more juggy face. When you've cleaned up the lower section head around to the Omega Block proper. Several of the lower lines go all the way up using multi-pitches, or you can just walk around from the afore mentioned fork in the trail. This is probably the most popular section of the outcrop, and the all time classic is "Witch", the grade 17 that follows the slimy green crack up the centre of the block. It's not a good choice if the rock is wet, as the crux (near the finish) involves hand jamming in a deep crack that retains moisture well. Never-the-less, no trip to this area would be complete without someone in your team attempting this awesomely fun trad lead. At the crux there's this bolt/piton thing (I forget what exactly), just out left, the eye of which won't take a carabiner but it can be threaded with a wire. Not that you need it, because the crack itself offer's good opportunities for pro, unless you're worried about occupying the best jamming with gear. If you're like me and better at crimping than jamming, the crux can be made simpler via use of a good edge high and right, though some jamming will still be required. It's a line that offers much entertainment, and generally attracts a group of onlookers. To get off the summit of this block, you can very carefully down-climb to the right, where the boulders are built up, or there are rap chains here and there, you'll have to look for them. Left: Michael leading through the crux jamming of "Witch", grade 17. If you're not feeling up to jamming, try the trad line "Wishful Thinking" that takes the same start as "Witch" but veers right at about 1/3rd the way up, and instead requires a high reach or dyno (above bolt) onto massive jugs. A hoot of a climb, and at 16 it's one grade easier than Witch. However, all of this is just a warm-up, because the main event is the sport lead "Bogie Till You Puke", a grade 21 pump fest about three metres left of "Witch". It can be top roped with ease, and if you're only just leading this grade I'd suggest you forgo the onsight and take a punt with the rope above you first. At grade 21 the moves are not really hard (except perhaps the opening ones), the main difficulty is pump management. Your forearms quickly load with lactic acid as you haul past the first few metres, and by the time you gain the rest ledge at the half way mark, you'll feel like they're made of lead. Rest up, because the second half contains the crux move, just as you push up past a bolt very near the arête at about the three quarter mark. This is where most people fall on lead if they are going to, though mainly due to pump factor than lack of technique. Heading further left around the corner you'll come to a wealth of harder lines. The pick of these is probably "Bloodline", because it's easily indefinable by the water streak, has a cool name, and is grade 22 where some of the other starred lines here are north of that grade (and beyond me). There are one or two less difficult routes on this face that are also worth investigation. "Wee Riper" grade 17, I think (from memory), is short but sweet. There are rap chains at various points along the summit of this face, so getting off is easy. Right: "Witch", the grade 17 that follows the slimy green crack up the centre of the block. Definitely make sure you try Poxbow, Witch, Wishful Thinking, Bogie Till You Puke, and Blood Line before you leave the Omega Block area. There's more than enough routes here to fill in a day or two, but eventually you'll have ticked them all, and want to look further a field. Enter the less frequented section of Camel's Hump, which resides below and right of the summit lookout. It can be accessed by scrub bashing up from the main road (See guide book for access notes). If this is the first time you've tried to gain this less travelled area, leave yourself at least an hour for access, route finding and general investigation. The lines are hard to find and scattered about, some on small blocks and outcrops at various height levels with lots of grassy scrambling in between. The pick of the lines in this area, is, by far (at least in my opinion), the delightful "Space Jugging", a hoot of a grade 15. It gets no stars, probably due to access issues, but once you're there it's joyous jug hauling all the way. 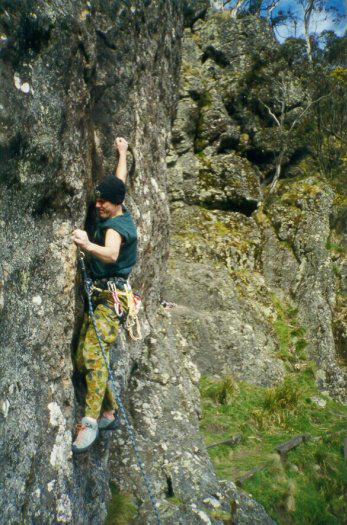 Left: Michael leading "Space Jugging", grade 15. Every move is off a huge jug! Bring two bolt plates, and a few trad pieces. Access this climb by soloing up the low angle rocks below and avoid scrambling up the dead end gully left of the climb. Camels Hump is probably my favourite local area outside of the big guns such as Araps, Gramps, Buffalo, etc. I say this mainly because I get sick of climbing the short granite slabs closer to home, when Camels offers some taller, steep, pumpy lines that are well protected, a combination that suits my style. It makes for a great day trip, especially if you're looking to escape the heat of summer. On the negative side it's a bit like going to an outdoor gym. Okay, not quite as bad as Werribee Gorge in this respect, but you certainly loose a little of the adventure with the crowds and the plethora of bolts. Not that either of these things is necessarily bad, and there's always a lichenous battle to be found somewhere, well off the beaten path, if the gym climbers get too much for you. Wills Climbing Page - Details on a few routes. Mt Macedon - Park's Victoria's page on this area. Camel's Hump - A little general info and a couple of routes described on RockClimbing.com web site.